According to Ohio State University, peaches are considered the queen of fruits and are second only to apples in production, sales and consumption in the United States. A peach pit can be planted in your own backyard to grow into a tree, but most commercial peaches are hybrids. If you plant a peach pit to grow a peach tree, your tree will not produce fruit that is like the kind that you got the peach pit from. Peach pits also require a chilling and stratification process before they will grow into a tree. Place a pottery shard over the drainage hole of a container, and fill the container with potting soil. Hollow out a planting pocket in the center of the container for your peach pit. Place the pit in the planting pocket, and plant the pit so that it is 3 inches deep inside the soil. Place the container outside and water. Keep the soil as moist as a wrung out sponge all winter. In spring, a tree sprout should emerge. 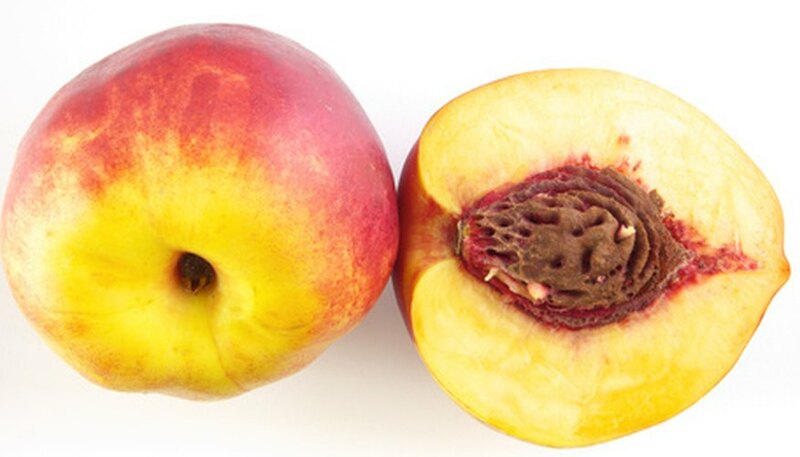 This technique only works in climates where winter temperatures drop low enough for the seeds to stratify, according to the Michigan Peach Sponsors website. Wash a peach pit thoroughly, and scrub with a nylon bristled brush to remove peach pulp. Allow peach to dry overnight. Fill a plastic zipper bag with a tablespoon of water. Shake the water in the bag. Pour the bag out, and place the seed inside it. Place the open bag in a refrigerator where no bananas or apples are stored. Bananas and apples produce ethylene gas as they ripen that will encourage mold on a peach seed. Store the peach seed in the refrigerator from summer to December or January. Then remove the seed, and fill the bag with peat moss. Place the seed in the peat moss. The seed should germinate in 1-1/2 months. Plant the seed in a container of potting soil 3 inches deep. Place the container in a sunny window or under a grow lamp, and allow the seedling to grow until spring arrives. Harden off the peach sapling by moving it outdoors daily. When the sapling has hardened off, select a site for your peach tree that is in full sun and well drained soil. Dig a hole in the ground for the root ball that is slightly larger than the plant. Place the root ball of the plant in the planting hole and cover with soil. Keep the soil as wet as a newly wrung out sponge until the roots become established. Some peach tree varieties do not grow well in zone 4 or colder climates. Before planting your peach tree in the ground, determine what variety has grown from the peach pit. If you live in zone 4 or colder, you may wish to keep your tree in a container, and move it indoors during the winter.